Safe and natural teether whith chewable parts that provides comfort and relief during teething therefor your baby will love to chomp on it. With a rattle inside and a safe wooden ring, it is the perfect size for small hands to hold. Embroidered eyes and presented in a lovely gift box. Made from Fabric - 100% Organic Cotton, Filling - 100% Corn Fiber. Recommended age from 3 months. 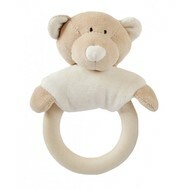 Suitable from Newborn. Tested to EN71, GOTS, CE marked. Made in Latvia (EU). Images for illustration only - one rattle supplied.